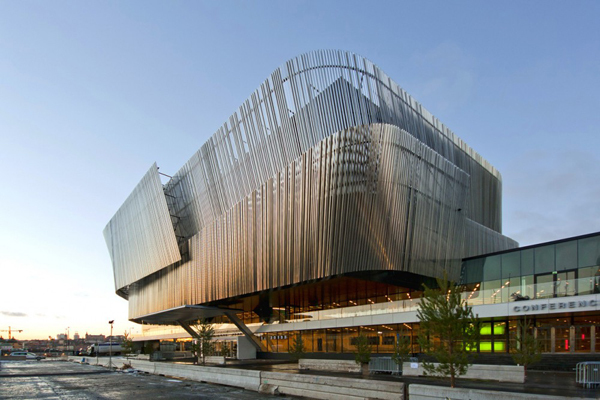 The Congress Center located in Stockholm was recently competed. 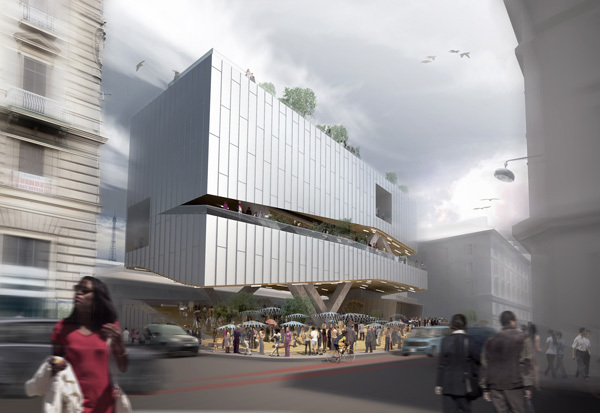 Positioned near the Central Station and along the Riddarfjärden bay, the design had to accomplish a high level of integration and introduce new trajectories which would connect the building with the city center. After the fire of the church in 2009, the Våler community needs a new church building. 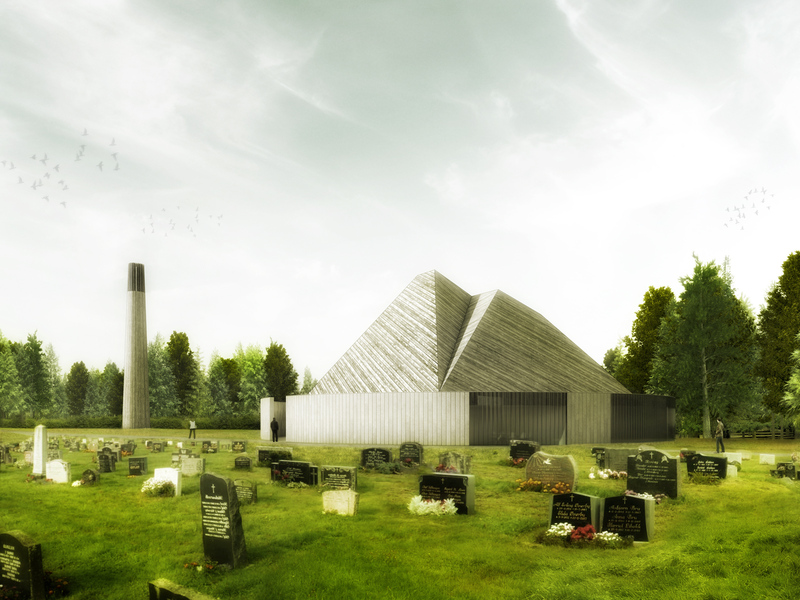 For this reason the Våler Parish Council invited architects for an open architectural competition. The new building should accommodate 350 people and provide many secondary spaces. The new building designed by Studio DMTW is to be placed next to the ruins of the old burned down church. In general, compared to the design of a secular building, where the focus primarily lies on the programmatically and functional aspects, a church has additive characteristics which need to be considered. Therefore the design of the new church Våler derives from two major factors. They’re called Thixotropes. Compositions comprised of eight illuminated mechanized structures create choreographies of lighting effects that alternate form warm to cold light. 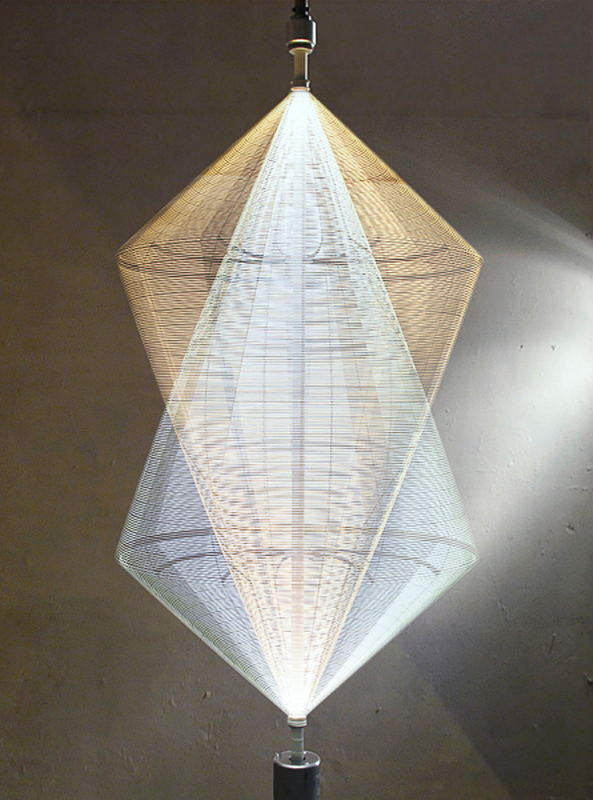 Designed by London based design firm Troika, these suspended systems merge technology with art and explore the realm in which rational observations intersect with the metaphysical and surreal. Architect Laurent Saint-Val proposes a new inhabitable bridge for Amsterdam. Fascinating mix of architecture with its 17th century’s canals registered at UNESCO World Heritage, AMSTERDAM, capital of Netherlands is the largest city of the country with a population of nearly 740 000 inhabitants (1.5 million with the periphery) and the most visited one with more than 3.5 million foreign visitors each year. It’s in the 12th century that the Dutch first settled in this marshy and inhospitable region that would become Amsterdam. 500 years later, during the 17th century, Amsterdam became the center of the world’s economy. Today, the Batavian capital is known worldwide for its openness to the rest of the planet, its tolerance and its bustling cultural life. Adventurer’s city, fishermen’s town, city of excess and extremes ; from a huge mansion to the narrowest house, modern architecture is developing between the historic building’s facades, giving a particular outcome and amazement for tourists. Due to the small size of the city, all interesting sites are within in a small area, making the visit even more agreeable. This is probably one of the reason why Amsterdam is so popular amongst poetry and architecture lovers. Wherever you walk in Amsterdam, you will notice that all constructions are made of brick. Never the less, it has not always been so, the houses were originally made of wood. Following the devastating fires of 1421 and 1452, it was forbidden to build with wood. In 1669, wooden construction was completely banned and only two examples are left standing. Undoubtedly, a knowledge and an architecural wealth slumber in the heart of the true Amsterdammers, ready to wake and be materialized in modern projects. It is with a strong motivation and a desire to pay homage to wood that I made the choice to use this modern material, ecological but also traditional and universal throughout centuries ; a material occupying a leading position with its qualities of sustainability, flexibility, adaptation to other materials, efficiency and finaly its esthetics. Wood, a traditional and universal material throughout centuries, has found the past few years a leading place, thanks to ecology. Therefore, every project today and particularly in Amsterdam cannot ignore the use of wood for new structures or ornament. 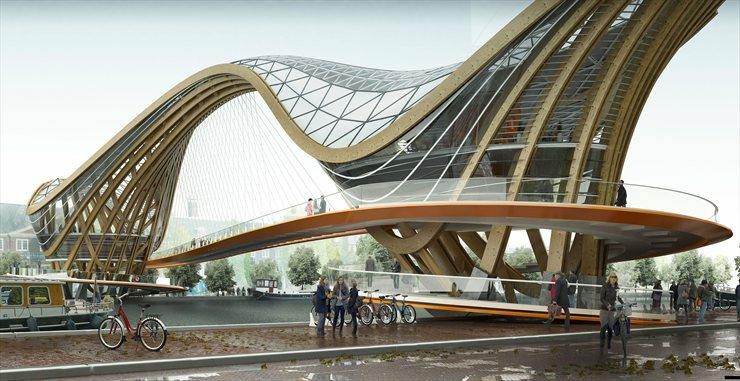 Interior and exterior designs of this bridge are intended descriptive, while highlighting the natural material. 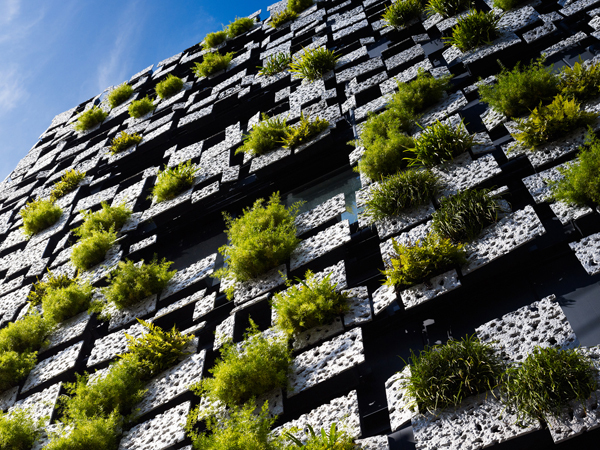 Associated with steel and aluminium it gains enormous advantages, since these metals generate extremely light structures, representing a vital aspect regarding the soil’s quality. Located in the heart of fashion and branded boutiques of Paris, the approach of this project designed by Ayrat Khusnutdinov and Gemawang Swaribathoro “you buy we cook ~ enjoy!” provides a unique chance to create not just another restaurant but a vibrant social hub fused with a possibility to transform a regular visit to an adventure. At the day-time, the wet market on the ground piazza gives a freedom for the customers to purchase raw food ingredients which they can offer to the students of the school as an assignment in order to try knowledge and improvise their skills by cooking with a random menu. 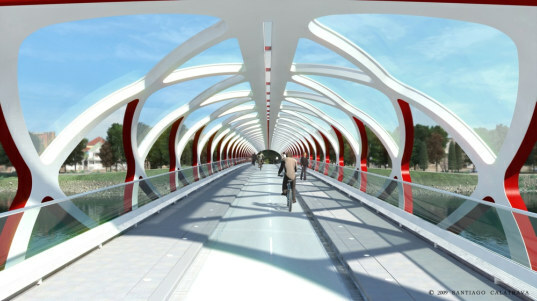 On Saturday, March 24 2012, The City of Calgary will celebrate the anticipated opening of Santiago Calatrava’s signature Peace Bridge. 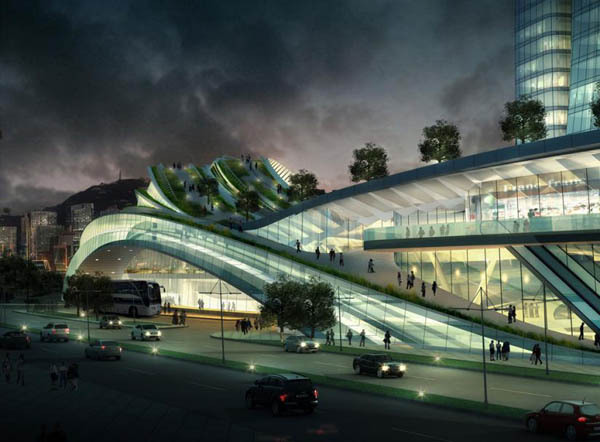 The red twisting helix shaped pedestrian bridge is unlike any of the renowned architect’s other designs. Known for his soaring, vertical icons, Calatrava opted to design a low single-span bridge in order to meet geometrical constraints. With a no fly zone enacted above the bridge due to a nearby heliport and the high water and ice levels of the Bow River beneath it, Calatrava had an envelope of only 7 meters in which to create his signature bridge. Additionally, the Peace Bridge was designed without supporting piers in the riverbed in order to minimize impact on the surrounding environment. These parameters influenced Calatrava’s decision to proceed with a tubular steel truss bridge; a highly technical, yet visually stunning design. 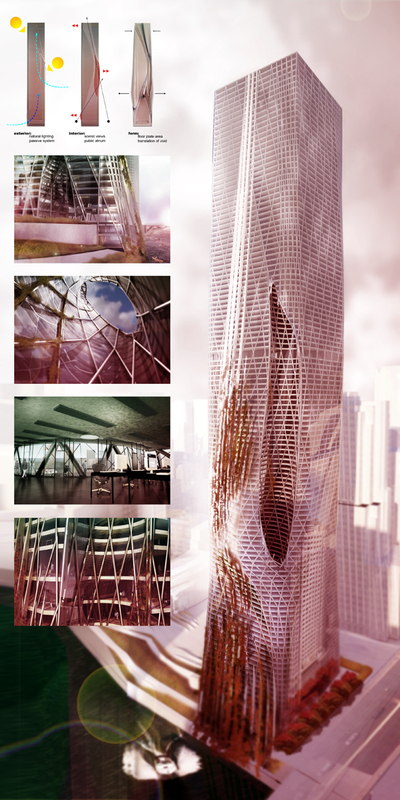 The Devoid Tower, design by Daniel Caven at the Illinois Institute of Technology, Chicago, explores the passive systems that can be incorporated into high-rise design. 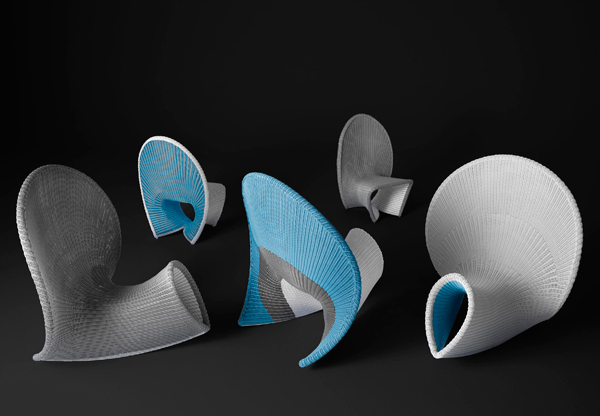 The design is influenced by a set of design rules, and tested using parametric and environmental analysis.